In this final part of this How to make beats in Reason series, TaurusBeats records piano freestyles to for the beat Even Still. 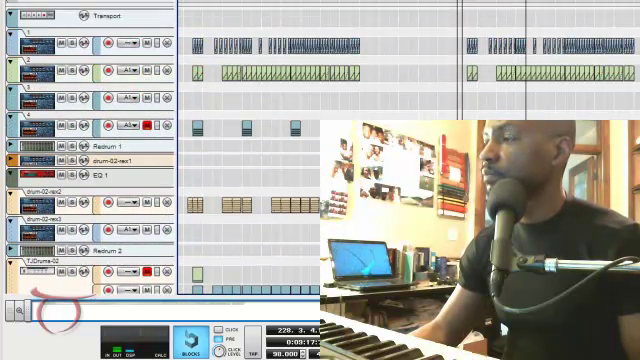 In this video, I am recording piano freestyles (improvisations) over the finished beat. These piano freestyles are unrehearsed, real-time captures of what I hear in my head at the moment. I do not edit my piano freestyles for mistakes. I think of the piano freestyle like a rap freestyle in a cypher (back in the day). Recover quickly when you mess up and get so good at it that people hardly notice your mistakes. This method (piano improvisation) is a tremendous help to me in so many ways. Piano freestyles help me THINK MUSICALLY, in verses, choruses, etc. They also help me with timing and inticipation. My ability to move around on the keys has also improved. Even my drum playing in live gigs has improved because of this practice. I show these piano freestyles to encourage other beatmakers to try the same. You may be like me. I never trained as a pianist and never had lessons. But I had a desperate desire to learn how to transfer the music I hear in my head to people's ears.